Add on: Lake Titicaca, Nazca Lines, Amazon Rainforest, a Pacific Beach Getaway, free days or extra activities. This eight-day adventure in Peru takes us to Lima, Arequipa, Cusco to the world famous ruins of Machu Picchu, and on a Colca Canyon tour, to one of the world’s deepest canyons to spot condors and take in the magnificent views. Day 2: Flight to Cusco. City and ruins tour, then free day. Day 3-4: Machu Picchu tour. Day 5: Early flight to Arequipa – Arequipa city tour. Day 7: Colca Canyon tour. Day 8: Flight to Lima. A beautiful early morning train journey across the high plain above Cusco then down the Urubamba Valley to majestic Machu Picchu. Known as one of the greatest architectural achievements in the world, this historic sanctuary is considered one of the seven manmade wonders of the world. After a guided tour, take time for independent exploration of this magnificent site. We will spend a night at the village below Machu Picchu and also come back the next day for more exploration. This allow you plenty of time at the ruins as well as time for some beautiful day hikes in the surrounding mountains on day 4. Sunrise at Machu Picchu! Today is a great day for independant exploration. During peak visiting hours (10-2), try a hike on one of the surrounding Inca trails on Wayna Picchu or Machu Picchu Mountain. Return by train and car to Cusco in the afternoon. An early morning flight to Arequipa. Arequipa is a charming colonial city at the foot of El Misti volcano, with the Colca Canyon, one of the world’s deepest, just a few hours away. On our included city tour, we’ll visit the huge and beautiful Santa Catalina Monastery as well as the Museum of Juanita, the Inca Ice Mummy. Early morning departure for your Colca Canyon tour. Keep a lookout for condors as we skirt the side of the canyon. This area also has some of the most extensive Inca and pre-Inca terracing in all of Peru. Overnight in the village of Chivay with a chance to soak in the town’s thermal baths. 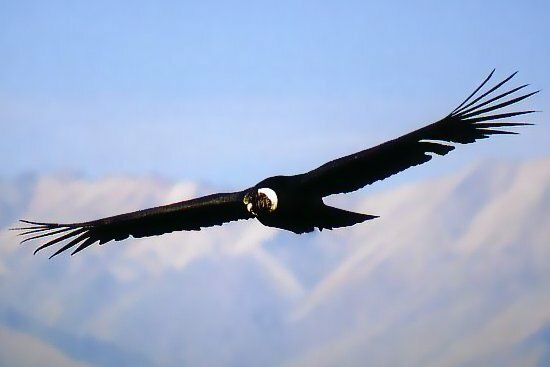 Colca Canyon tour. Early departure to look for Condor flying above the canyon. In the late afternoon return to the comforts of Arequipa. Overnight in Arequipa. Early morning flight to Lima. International flights may depart any time after 2pm today. Condor Express is an eight-day tour which includes walking in various ruins and on city tours. As always, a certain patience is required for the inconsistencies and occasional delays of developing-world travel. It is best to bring from home such items as prescription medications, eyewear and care, unusual film and camera batteries. Please make sure you bring your used batteries back home to recycle! Arequipa and the Colca Canyon tour: Arequipa and the Colca Canyon tour are temperate, while the journey to the Colca Canyon is very cold in the morning.